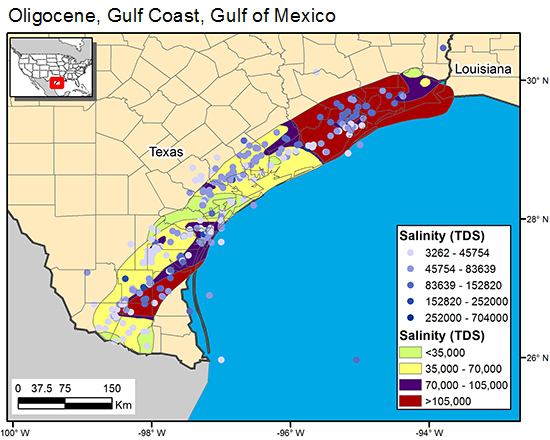 Salinity has been mapped in Frio oil fields by Morton and Land (1987), as have major- and minor-element ratios. Significant vertical and lateral variation in fluid chemistry is well documented in the Gulf Coast basin and reflects the dynamic evolution of this thick sediment wedge (Macpherson, 1992). Macpherson, G. L., 1992, Regional variation in formation water chemistry; major and minor elements, Frio Formation fluids, Texas: American Association of Petroleum Geologists Bulletin, v. 76, no. 5, p. 740–757. Morton, R. A., and Land, L. S., 1987, Regional variations in formation water chemistry, Frio Formation (Oligocene), Texas Gulf Coast: American Association of Petroleum Geologists Bulletin, v. 71, no. 2, p. 191–206.